Distinguishing Characteristics Caucasian female. Brown hair, brown eyes. Allegro has a scar on her abdomen. She had previous fractures of both of her ankles which had healed prior to her 1982 disappearance. Allegro has a small tattoo of a rose or a butterfly below her navel. She wears a full set of upper dentures and a partial plate on her lower teeth. Allegro's ears are pierced. Her nickname is Cindy. Allegro may use the last name Tweite. 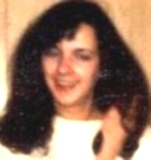 Allegro was last seen at her residence on East Walnut in Independence, Missouri on February 12, 1982. She and her boyfriend planned to stay in St. Louis, Missouri over that weekend. It is not known if Allegro and her boyfriend arrived in St. Louis; she has never been seen again. Her rental car was discovered abandoned at Kansas City International Airport in Missouri shortly after she was last seen. The vehicle's windshield had been broken and there was no sign of Allegro at the scene. Foul play is suspected in her disappearance. Updated 2 times since October 12, 2004. Last updated June 10, 2008; picture added.